I am Sarah Lee-Wong. This was my third birth and it was the best birth experience. I had two traumatic previous labour and I was very fearful of having a difficult labour. Both of my previous births were also induced. I suffered third degree tears for my first, and my second had to be vacuumed out. This round, I felt I was being pressured into induction by my doctor who repeatedly said so since Week 34 that my baby’s head was going to get too big for me. My doctor commented that “Better a natural birth (by induction) than wait too late and have baby stuck” was her sentiment. The baby was also still posterior facing in the last week of my pregnancy. However I was determined to have this baby come when she was ready, and I really wanted to have a pleasant, calm and gentle birth experience. I am thankful to have Yen help my husband and I with the exercises to help baby turn to a better position for labour. 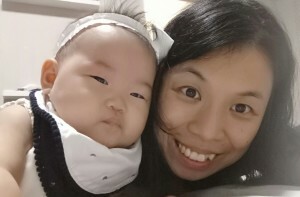 Even though I saw Yen past my EDD, and my labour seemed to have stalled for over a day (a start-stop labour is typical of posterior babies), I believe that the exercises were very helpful in getting my body adjusted so that baby could move into a better position for birth. Our sweet baby girl arrived about 12 hours after we left Yen’s place. My Doula Catherine came over just in time to help me w pushing baby through. I was scared at some point that I wouldn’t be able to push her out. But I did with Catherine’s coaching and remembering also what Yen mentioned about needing to release tension. The entire labour and birth process was so much better than I could imagine. In fact, the birth was so gentle that baby arrived in her water bag. I also had no tear or need for any pain relief during and after birth.